UK hose suppliers Buckley Industrial have an extensive range of Air Fittings available for many industrial applications. 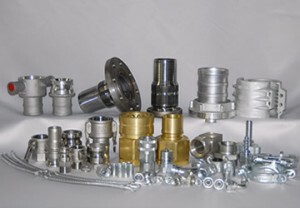 These include Quick Disconnect Couplings, Perfecting N & P Series, Air King Fittings and Clamps, European Compressor Couplings clamps and accessories, as well as Safety Cable or Whip Checks as they are also known. These are designed to protect portable opr stationary air tools by efficiently oiling the tool mechanisms. Each time an air tool is operated, a fine mist of oils is injected into it along with the air from the compressor. Installation is recommended within 25 feet of the tool to be lubricated. Transparent sight disc allows visual inspection of oil level. Oil flow regulated by screwdriver screw adjustment. This is not recommended for constant flow applications. You can use an petroleum-base, non-detergent lightweight oil (SAE 10/150SSU), which will readily break up into a mist. For example, MOBIL DTE light or comparable oil. It is advised to take note that you should not use any synthetic oil or oils containing additives or solvents. Air Hose Coulings is a form of energy that can be one of the most dangerous, due to it being used in a large number of applications. When mishandled, it can have more serious results than fluids. Air, as a gas, is compressible; fluids press only against hose or vessel walls and lose little volume under pressure. When pressurised air releases suddenly and does so with explosive force and can cause rapid hose whip, which can cause serious physical harm to personnel or damage to nearby objects. This is why the selection of proper hose and hose couplings for air-lines is particularly important, along with proper installation and maintenance. Air King Universal couplings can be recommended for 10 bar (150psi) working pressure at ambient temperature (21°C). It is recommended that an Air King safety clip or wire retainer is used to avoid accidental disconnection. In addition, a King cable should be standard practice on the supply end of the hose.